With harvests and travel season both at their peaks, summer is prime time for agritourism. Farm tours, U-picks, farm stands, festivals, food-crafting classes, bed and breakfasts, and wedding and event hosting are just a few of the ways that farmers are opening their doors and fields to the community. In the local food economy, where margins are slim but public interest is high, paid farm experiences are helping many farms make ends meet. According to the latest Census of Agriculture numbers, farm income from agritourism has grown 24% from 2007 to 2012, generating about $700 million. Such activities help small farmers diversify their income stream and build customer loyalty. “We use all avenues that we have available for selling our crop, and U-pick is just one of the ways we do it,” says Larry Glashoff of Glashoff Farms in Solano County. For eaters, visiting a farm provides a deeper connection to where our food comes from, along with a taste of the work that goes into it. With a history of more than 50 years of dairy farming, Bob and Dean Giacomini founded Point Reyes Farmstead Cheese Company in 2000 and started producing artisanal cheese with their four daughters. The family soon found itself inundated with requests from customers who wanted to see their ranch and cheese-making process. “We had to say no to them because we didn’t have a place to facilitate an educational experience,” says daughter Jill Giacomini Basch. After years of hosting impromptu tastings in their family’s kitchen, they realized the value in creating a more formal venue to showcase their cheeses, so in 2010, they built a commercial kitchen and dining a room, which they named The Fork. Jill refers to it as a “culinary and education center,” where they host tastings, cooking classes, and other public and private events. 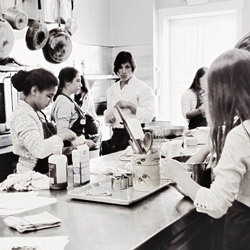 The Apple Farm in Philo also offers hands-on cooking classes, with the addition of overnight stays in a retreat-like setting. Sally and Don Schmitt, founders of the Yountville institution The French Laundry, acquired the historic orchard in 1984 with a dream of taking their family back the land. The Schmidt’s daughter, Karen, and her husband, Tim Bates, came on board to help convert the farm to organic and biodynamic practices. Weekday stays offer a quiet retreat for guests (“We don’t spend a lot of time with our guests on weekdays because we’re working,” says Karen), while on weekends the Bates offer a more personal and hands-on experience that includes cooking classes. As the Bates think about the future and what their children are willing to take on, they see the B&B as vital to the farm’s long-term economic viability, accounting for about a third of its income, with another third in apple sales and the rest in value-added products, such as jams and chutneys. “We’re trying to build some sustainability into the business,” says Karen. For eaters of all ages, even a day trip to a farm can create a lasting impression. Capay Organic in Yolo County welcomes about 7,000 visitors throughout the year at their farm tours and festivals. 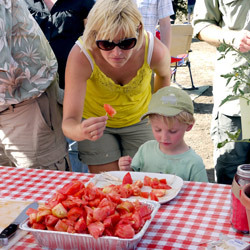 Events like the annual Capay Tomato Festival are filled with tastings, tractor-pulled tram rides, and other family-friendly activities. The Apple Farm (Philo): Guest cottages, stay-and-cook farm weekends, event hosting, and more. Details. 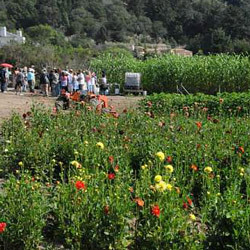 Capay Organic (Capay): Farm tours, dinners, and festivals throughout the year, including the annual Capay Tomato Festival on July 19, with optional overnight camping in the fruit orchard. See a full schedule. Devil’s Gulch Ranch (Nicasio): Farm tours, dinners, and more, including an open house on August 10 and 11. The ranch also partners with the Marin YMCA to offer summer camps for kids. Glashoff Farms (Fairfield): Berry U-pick by appointment only. Blackberry season is at its peak and winding down in the next couple weeks. To find out about the next berry U-pick, email Larry Glashoff or sign up for the newsletter. 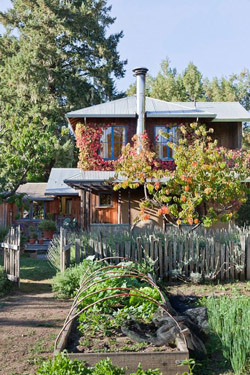 Green Gulch Farm (Muir Beach): Retreat center offering public programs and guest and residential stays. Learn more. Lonely Mountain Farm (Watsonville): Farm dinner on July 13. Point Reyes Farmstead Cheese Company (Point Reyes): Weekly farm tours, monthly farm dinners, and cooking classes. See a full schedule. Thomas Farm (Aptos): Dahlia U-pick and picnic on July 27 and August 24, with farm dinners on the horizon. Swanton Berry Farm (Davenport/Pescadero): Farm stand and berry U-pick. Learn more. CUESA offers monthly tours to Ferry Plaza farms. Stay tuned to our e-letter for upcoming announcements. Capay Organic photos by Bill Goidell. Point Reyes Farmstead Cheese Company photo by Courtney Caldwell. The Apple Farm photo by Jesse Narducci.